Our services eliminates conflict of interest to our clients and provides for a neutral trading environment. We do not act as a counter party to any of our client's trades. ATC Brokers Limited is Regulated by the Cayman Islands Monetary Authority. Participate as a Maker and Taker through our direct API order execution. View our competitive pricing through our top tier banks and non-bank participants. 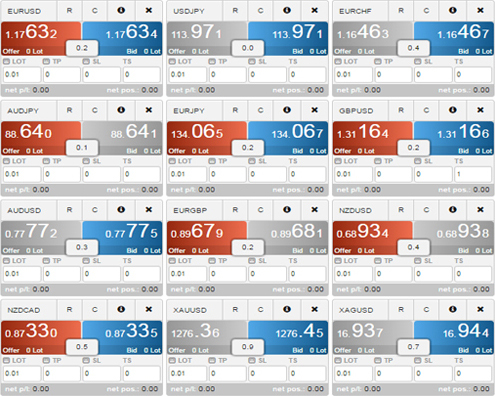 Obtain competitive spreads on major currency pairs. Enhanced MT Pro software for MetaTrader with a complete back office access. Connect your software or strategy directly to the ECN aggregation engine. Access to the FX, Metal and CFD markets from one account. Enhance your MetaTrader 4 with our MT Pro software for MetaTrader. Taking the MetaTrader 4 to the next level, by providing you with additional features that optimises your trading experience. View the amount of contracts available at different price levels. Set custom orders with predefined trading objectives. Enter or exit the market instantly with a single click. A sophisticated tool designed with simplicity in mind. A partnership solution for every need. Obtain the tools required to run your business efficiently. As we innovate technology to the changing needs of market participants, our partnership offerings allows for the enhancement of your operation. Utilise our expertise and services to establish or expand your company. Obtain our turn-key infrastructure to enhance or establish your brokerage firm. Custom software solutions to facilitate the trading for multiple accounts and strategies. Expand your clientele base by utilising the latest technology and trading resources that is offered in the industry. The economic calendar provides you with the schedule of economic indicators that moves the global financial markets. Understand what the market is expecting and make the right calls. React first to events in the global financial markets. Follow the latest on currency pairs, metals, and keep up to date with the latest trends, technical analysis and commentaries. Obtain answers to many of the common questions that are asked. If you have questions that are not listed on the FAQs and need further assistance, simply contact us.